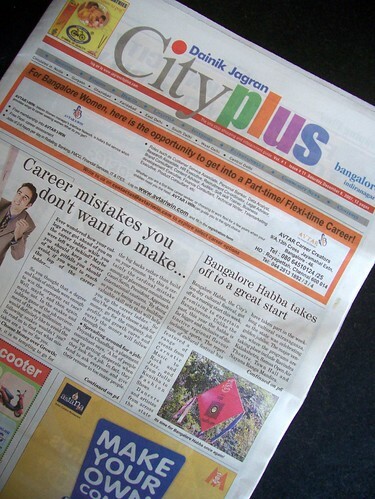 The simple way perhaps for Dainik jagran is to steal; y’day came across this edition of city plus and was surprised to see my photo from Bengalooru Habba 07 post being used without due credits in their front page Habba news report…. Being familiar with Midday using Metblog photo’s now it’s another daily trying to get their hands on the snaps (protected by creative commons). Not a good gesture from print media for sure!! Part of the city’s traffic woes stem from the ease ,rather impunity with which two wheeler riders climb on the footpaths to take short cuts. This is a major problem which,at times,has almost injured the pedestrians who use these footpaths. While the law has not yet woken up to this menace ,it would be nice if the IT and BPO companies could educate their employees on road sense.This is because majority of the guilty hail from these sectors though I am not generalising. In global sense (may not apply to this blog and this particular paper alone), its like a mutual relationship – blogs often get inspired from print media, and sometimes quote more in text than legal. Print media is probably paying back. I agree with Giridhar.. There is no way for you to prove that it is indeed ur photo unless u watermark it.. And there is no reason for a photo to be on the internet without a watermark (IMHO).